‘Get out. I need to go to my mind palace.’ Sherlock Holmes visits his Mind Palace in the BBC series, Sherlock. The mind palace—also referred to as the memory palace or method of loci—is a mnemonic device which uses location-based visualization to help organize or recall information. 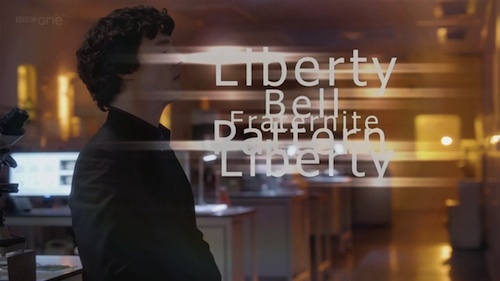 In the BBC television series Sherlock, Sherlock Holmes withdraws into his mind palace, seeking clues and mental cues to help solve the Hounds of Baskerville Case. I then set a Location reminder for creative ideas. “Weird story about robot bugs in space!” I tell my phone to remind me about this idea when I arrive at…the library, or my favorite coffee shop, or the game store. For collaborative ideas, I set a reminder for…the Morristown Hyatt (Metatopia), my sister’s house, or a friend’s apartment in Boston. The awesome side effect of my digital method of loci is that, after one or two reminders, I no longer need the phone to jog my memory. After internalizing the reminder, it comes to mind automatically when I enter the associated space. It’s like geocaching, but for the incorporeal! *And good golly! You don’t need a smartphone to track your creative ideas. Everyone, whether or not you’ve got a bells n’ whistles phone, should be carrying a notebook and pen around at all times. You never know when inspiration will strike. If it strikes at 4:30pm, in the middle of a meeting (and at the tail end of your workday), that idea may be gone forever if you don’t write it down.